1Slapback — Synonymous with rockabilly guitar effects, Slapback delivers a short single-repeat echo based on early tape delay machines. 2Digital — A classic clear digital delay with optional delay time modulation. The intensity knob controls filtering allowing for high pass filters (creating a thinner delay sound) or low pass filters (creating a warmer delay sound). 12 o’clock on the Intensity knob offers a 100% pure, unfiltered delay. The Nemesis features a 56-bit signal path with a 24-bit delay line for immaculately clean repeats. 3Diffuse — A delay line with a diffusion effect that smears the attack of the repeated signal, softening it and allowing it to blend in more easily with the unprocessed dry signal. This creates an ethereal sound reminiscent of classic “oil can” delay systems. 4Analog — The sound of classic bucket brigade analog delays. Successive delays are warm, resonant and increasingly lo-fi. 5Tape — A detailed re-creation of classic moving-head tape delays. Tape captures all the characteristic flutter, warmth, and color that give vintage tape delay machines like the Echoplex and Space Echo their classic charm. 6Noise Tape — A detailed re-creation of classic fixed-head tape delays. Noise Tape is grittier and darker than the Tape engine, capturing the sound of old or damaged tape. 7Degrade — A primitive Lo-Fi digital delay with bit crushing and sample rate reduction. This creates unique retro sounds with varying amounts of distortion, noise, and aliasing. 8Shifter — A delay with polyphonic pitch-shifting on the delayed signal. Choose from octave (either up or down), minor or major 3rds, 4ths, and 5ths. 9Helix — This angelic delay effect combines reverse delay with an octaver to create a strange, shimmering delay that disappears into the upper frequency range. 10Reverse — The classic reverse tape sound made popular made popular by a number of iconic psychedelic ere guitar players who shall remain nameless. 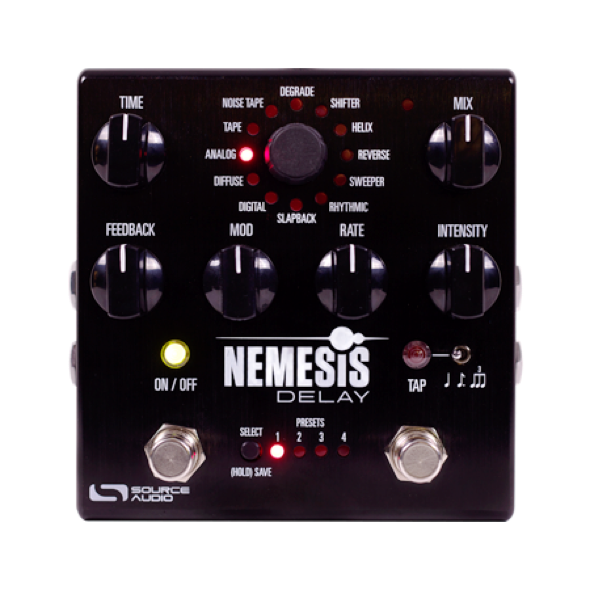 The Nemesis creates several overlapping reversed delays that fade in and fade out regularly to create a pulsing tremolo effect. 11Sweeper — A resonant low pass filter slowly sweeps across the frequency range, creating an undulating synth-like effect. 12Rhythmic — The Nemesis delay line contains 6 taps. This allows for the creation of rhythmic patterns in the delay effect. The Rhythmic effect uses 4 taps to create a wide variety of rhythms. 124 Delay Engines — Nemesis features 12 onboard delay engines accessible via the center selector wheel, plus an additional 12 delays downloadable via the Neuro Mobile App. 2128 Presets — Save up to eight presets accessible via the onboard controls or save up to 128 presets recallable with MIDI program change (PC) messages. 3Stereo Input and Output Jacks — Create dramatic stereo ping-pong delays, stereo phase inversion, or set up an external effects loops, pre or post delay. 4Tap Tempo — Tap in the delay time with the onboard tap tempo switch. Beat divisions include quarter notes, dotted eighth, and triplets. 5Hold (a.k.a. “Freeze”) Control — Use the tap tempo switch to freeze a small portion of the delay in a continuous loop. 6Deep Editing Functionality with the Neuro Mobile App. — Adjust additional parameters, save and share personal presets, and download bonus delay engines with the Neuro Mobile App. (Check the Neuro tab for more details). 7Complete MIDI Functionally — Send MIDI program change (PC), continuous controller (CC), or MIDI clock messages via the 5-pin MIDI DIN Input (also includes a MIDI Thru jack) or the USB port. 8Universal Bypass — Select either analog buffered or relay based true bypass. 9Expression Control — Assign expression control to any combination of knobs and program the depth and direction of each. Compatible with all Source Audio expression pedals, the Hot Hand 3 Universal Wireless Effects Controller, and 3rd party 1/4” TRS (tip hot) expression pedals. 10External Switching Capabilities — Change delay presets with an external 1/4” TRS (tip hot) footswitch. 1Free Effects Downloads — Access an additional 12 free effect engines and burn them to any position on the rotary encoder. 2Customize Effects — Make deep editing changes with a wide range of additional parameters. 3Save and Share Customized Presets — Once you’ve fine-tuned an effect, save it to your personal effects collection and share it with the growing community of Neuro users. 4Download Presets — Explore Source Audio’s ever-expanding, library of free effect presets. 5Simple Connection — The Neuro App. connects with the Nemesis Delay via the mobile device’s headphone jack and stereo Input 2 on the pedal. A Neuro App connector cable (1/8” to 1/4”) is included with the pedal. 1Preset Saving / Program Change (PC) Messages — Save up to 128 effect presets recallable with MIDI CC messages. 2MIDI Clock — Sync your delay time with external MIDI clock messages. 3MIDI Continuous Controller (CC) Messages— Control multiple knob parameters simultaneously with MIDI CC messages. Program your CC messages to control any combination of knob parameters (as well as output level) and map an independent depth and direction path for each. 4USB Port — Send MIDI program change, continuous controller, and clock messages to Nemesis via its USB port. 5Multi Pedal Scene Saving with the Neuro Hub — Connect Nemesis (along with up to five One Series or Soundblox 2 pedals) to the Neuro Hub and create 128 multi pedal scenes complete with expression control, recallable via MIDI program change (PC) messages. 6External Expression Control — Connect the Neuro Hub to any Source Audio expression pedal, Hot Hand 3 Wireless Effects Controller or third party TRS (Tip Hot) expression pedal and assign expression control to any combination of knob parameters. 4USB port — Connects to Mac or Windows PC for MIDI control of firmware updates.